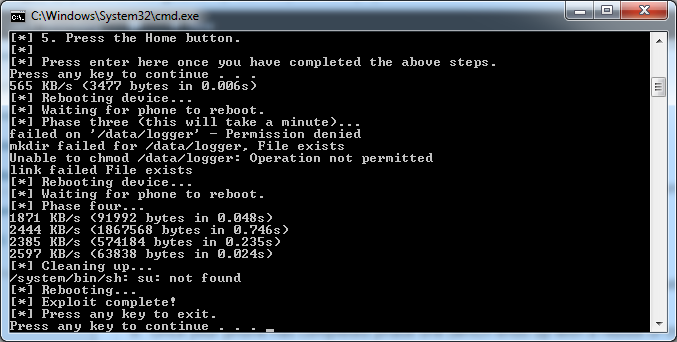 Here are my notes on rooting and installing Cyanogenmod 10.2 on my Motorola RAZR Maxx. I am going to live on the edge and install a nightly to get to 10.2. If you don’t want bugs, use a stable version. By default, Cyanogenmod cannot ship with Google Apps by default, so these will need to be installed manually. Without these, you will not have Google Play, Music, Maps, etc. In this case, grab a copy of gApps for 10.2. 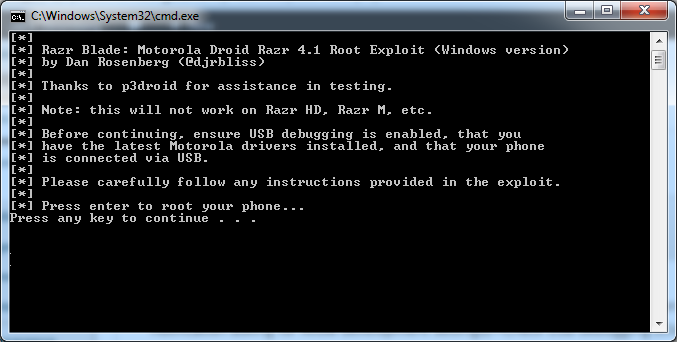 Extract the files of the razr_blade_win.zip archieve. Select the size of your data store (I used 3GB, couldn’t find any documentation on what that actually does), and then hit Activate. Note, Google Apps are totally optional. If you want to roll with Stock Cyanogenmod and manually install apps via their APK files for ultra security, that is totally cool. This entry was posted in Android Development and tagged Custom ROM, Cyanogenmod 10.2, Droid, gApps, Google Apps, Motorola RAZR Maxx, root on September 18, 2013 by Jack. Thanks a lot! Used it for my xt910 to install CM10.1. Dude! I’ve hated the Motorola ROM since day 1 and have been looking for a replacement. Thanks so much for this tutorial. It is (insert Tony the Tiger here) greeeeeeeaaaaaaaaatly appreciated. Nicely done. Jack, that was a wonderful tutorial on installing a custom ROM on my Droid. I’m enjoying the mod. Thanks! Update: My Verizon 4G LTE wasn’t working initially. I did some messing around and I needed to go to Settings -> Wireless & Networks, More -> Mobile Networks -> Network Mode -> CDMA+LTE/EVDO then it worked. After following two other walkthroughs for my Razr Maxx, including the one on the CyanogenMod site, this one finally worked! And when I say the others didn’t work, I mean at one point my phone force reset itself with no OS installed, and I had to use Matt’s Utility to revive it. I started with your tutorial after that catastrophe, and lo and behold I got from start to running CM in about 30 minutes total! Your steps are clear and concise, and everything here works perfectly. Thank you so very much for taking the time to do this! I have still isue with denied access. I have smart actions Version 4.2.2.5.0. I would say it is the latest version. Anyway i do not really understand what happend with permissions if I add baterysaver on smartactions. I alway thought that smartactions is an application that run specific apps or settings under specific circumstances. And it is a Motorola app. maybe anotehr issue for me could be that i have the german version on my phone, translatet something wrong and did the wrong settings. i would appreciate if you have a screenshot of that application. Not sure what the latest version of SmartActions is, but I would assume if it shows it is the latest in the market, you are good to go (maybe their is a different version specifically to Germany that could cause this?). Did you make sure you completed step 11 to get SmartActions in the correct mode? Also, make sure you run all batch files as Administrator to ensure it has whatever permissions it needs to execute the hack. 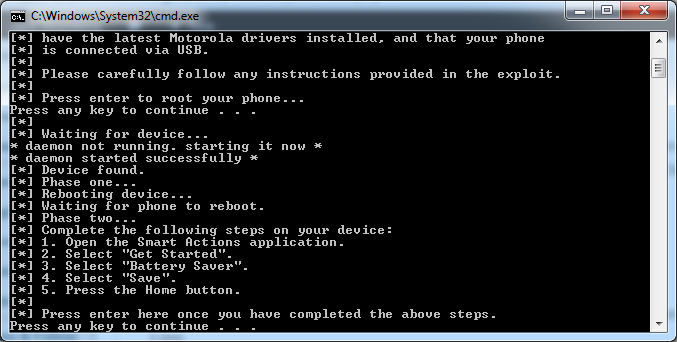 I’m trying to use this tutorial to root and install Cyanogenmod in my Motorola Razr xt910 (gsm). Are you running the script as an Administrator? Other than that, I can only think of the SmartActions being the incorrect version from the market (not 100% sure what the exact version that is needed).